Copyright 2011 the Author - The University is continuing to endeavor to trace the copyright owner(s) and in the meantime this item has been reproduced here in good faith. We would be pleased to hear from the copyright owner(s). Jacobaea vulgaris Gaert. (ragwort) is a serious noxious weed of high fertility pastures in high rainfall regions of southern Victoria and Tasmania in Australia. 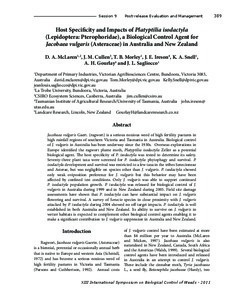 Biological control of J. vulgaris in Australia has been underway since the 1930s. Overseas explorations in Europe identified the ragwort plume moth, Platyptilia isodactyla Zeller as a potential biological agent. The host specificity of P. isodactyla was tested to determine its safety. Seventy-three plant taxa were screened for P. isodactyla phytophagy and survival. P. isodactyla development and survival was restricted to a few taxa in the tribes Senecioneae and Asterae, but was negligible on species other than J. vulgaris. P. isodactyla showed only weak oviposition preference for J. vulgaris but this behavior may have been affected by confined test conditions. Only J. vulgaris was able to support continued P. isodactyla population growth. P. isodactyla was released for biological control of J. vulgaris in Australia during 1999 and in New Zealand during 2005. Field site damage assessments have shown that P. isodactyla can have substantial impact on J. vulgaris flowering and survival. A survey of Senecio species in close proximity with J. vulgaris attacked by P. isodactyla during 2004 showed no off-target impacts. P. isodactyla is well established in both Australia and New Zealand. Its ability to survive on J. vulgaris in wetter habitats is expected to complement other biological control agents enabling it to make a significant contribution to J. vulgaris suppression in Australia and New Zealand.